Chicken is an excellent source of lean protein which helps muscle growth and repair, making this salad an excellent way to repair tired arms and legs after a tough workout. It also contains an amino acid called ‘tryptophan,’ which increases the serotonin levels in your brain, relieving stress and enhancing your mood. 2. Drizzle the chicken breasts with sesame oil, then wrap loosely in foil. Put on a baking sheet and bake in the preheated oven for 15–20 minutes, until cooked through. Cool slightly, then pull the meat apart with your fingers to shred it and put in a large mixing bowl. 3. Add the spring onions, fresh coriander, fresh mint, dried fried onions and sesame seeds to the chicken and toss together. 4. In a separate small bowl, whisk all the dressing ingredients together. 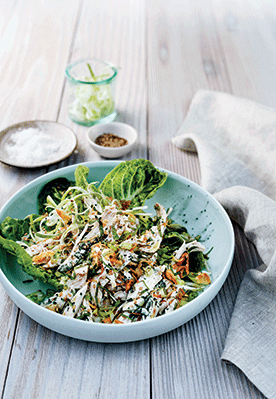 Drizzle over the chicken salad and mix together, then serve with either cooked brown rice or a big green salad.